The Shin Megami Tensei franchise's first entry on the 3DS will be a re-release with extra content. The latest issue of Famitsu features details on Atlus's first official move from DS to 3DS. 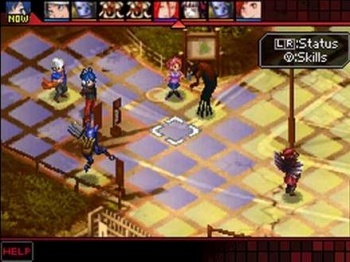 The magazine reveals Devil Survivor Overclock, a 3DS remake of Nintendo DS strategy-RPG Shin Megami Tensei: Devil Survivor. Translations of the article on NeoGAF say that Devil Survivor Overclock is an upgraded version of Devil Survivor with additional content. Atlus is adding voice acting for the entire game, higher resolution graphics, and a brand new scenario that takes place on the game's 8th day. It'll also include more demons; up to over 150 from Devil Survivor's 130 or so. The translation also apparently reveals that Devil Survivor Overclock will feature most of its action on the 3DS's lower screen, i.e. not the 3D one. According to Famitsu, the screen placement will be the same as it is in the DS version of Devil Survivor, so 3D might not be a big part of Overclock. The game is currently 90% complete. It's great to see Atlus jumping right in with support of the 3DS, but I'm hoping this isn't the start of a widespread remake syndrome in 3DS development. When the future 3DS lineup revealed that Atlus had a new Devil Survivor title in the works alongside other Shin Megami Tensei games, I think most of the title's fans were hoping for a sequel. For anyone that's played the game already, an 8th day scenario seems tacked on as the game ends pretty well (in multiple ways), it already has tons of demons, and voice acting isn't something that's necessary in my book. If I hadn't already played Devil Survivor, sure, Overclock would be great, but here's hoping that Atlus has more than just remakes planned for its 3DS Persona and Etrian Odyssey titles.